Looking for something fun that the whole family and can do together? Maybe something to help everyone learn while enjoying time together? 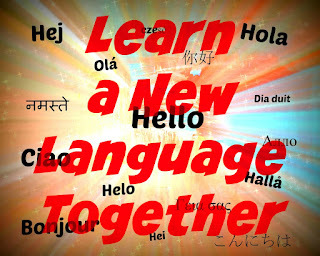 Why not try to learn a new language together? With the vast amount of resources available on the internet, learning a new language can be easy, fun and free. There are sites that offer lesson plans, free printables and more. For example, if you want to learn Spanish you many want to check out Study Spanish.com, All Free Spanish.com, or Online Free Spanish.com (this one is really great for teaching kids). You don't have to stop at just wanting to learn Spanish - you can learn many other languages online for free from such sites as Duolingo.com, which has many different languages and allows you to go at the pace you want to learn.You can also check out Learn a Language.com, which offers 19 different languages to choose from to study and learn. No matter what language your family chooses to learn together, with the vast amount of resources available, learning together can be a fun (and free) way to create great memories while learning something new.